This conservation resource was created by Remy Altasserre; Kara Lindsay; Gabriel Macalalag; Xuedan Xu. It is shared under a CC-BY 4.0 International License. The Kaloko fishpond, one of the three ponds under protection by the Kaloko-Honokohau National Park , is located on the Big Island of Hawai’i. Traditionally, the fishpond served as a nursery for fish to grow in, and when they reached maturity, were then harvested for food . The success of the fishpond's kuapa (seawall) served as a testament to the Hawaiians’ skill and understanding of their natural land . It held up for hundreds of years, through maintenance of the local people, but in the 1950s, it was destroyed by storms as the citizens had left the area . The Kaloko fishpond is in the process of being rebuilt with the help of community members, project funds and the US federal government . It is preferred that only qualified Native Hawaiians lead the process of restoration and maintenance of the pond . Through the collective effort of these groups, the pond is returning to its original state — serving as a natural habitat for fauna, fish, and endangered water birds of the islands . One thing known for sure is that the ancient Hawaiian rulers constructed the wall using the labor of thousands of people. The material used in building the wall were stones found nearby which were dry stacked on top of each other. This method allowed the construction of a stable and durable wall without the use of mortar or other binding agents. It also made the wall maintainable as stones could be replaced easily. The dimensions of the wall after construction were 30-40 feet wide, 6 feet high and stretching for 250 yards. The construction of the wall was a source of pride to a lot of the native Hawaiians since it showed their understanding of architecture, the natural forces around them, and the way that they worked with their abundant natural resources. The fish pond was a great source of food for the Native Hawaiians since it was able to hold large amounts of fish within its boundaries. The pond was used as a way of harvesting and raising fish while requiring little effort. To ensure proper care of the fish within the pond, a Kapu, or taboo, on fishing would be placed during certain seasons. This allowed the fish to grow into harvestable sizes. When it came time for harvest, the natives were not worried about overfishing the population since it would be naturally replenished through the changing of tides. In order to acquire the fish from the pond, the Hawaiians would weave nets and place them around the area. They would then harvest the catch at low tide, throwing out the fish that were too small to eat. With their abundance of fish, the Hawaiians would trade with their inland relatives for breadfruit, taro, and other foods.. The pond served as a great tool for survival for the Hawaiians, and without it life in the village would have been more of a struggle. A large part of Hawaiian culture is to be strongly connected with nature, earth, and the surrounding environment . There is said to be a delicate balance between land, sea, and the extended family . Since time immemorial, Hawaiians have been known to be very environmentally conscious towards their vital resources and thus acquiring them with the utmost respect . They value the nature of their environment —specifically fishponds, so firmly, as many of their cultural practices are performed in this domain; like their occupation, and acquisition of food. For native Hawaiians, fish were the main food reserve and the food item that provided the most protein for their diet. The two main types of fish harvested in the pond were milkfish and mullet . Like mentioned above, the Hawaiians cherished their environment like no other, therefore when they acquired fish for food, basically everything that was edible was also consumed. Not only was fish consumed as the main component of the Hawaiian diet, but it was also used as a cure for illnesses, and in many ceremonies . The acquisition of fish allowed people to reconnect with the environment and the local food sources that come along with it. This connection maintains the preservation of traditional food ways as well as the production capacity of the coastal waters . In addition to planting and cultivating, fishing plays a large role in the daily lives of present and ancient Hawaiians . They practiced sustainable fishing methods in order to keep the ponds intact, as they understood that their means of life lived within those waters . Fishermen acquired extensive knowledge about the coral reef areas and the shoreline, as well as various techniques such as diving skills, and the use of nets and traps . Hawaiians would capture the fish, release them into the fishpond, and then harvest them until they were ready to be consumed . A catch made by the fishermen would be portioned out to the entire community so that no one would go hungry . Fishing was not only a form of food acquisition but provided an income for many families. During the late 19th century, fish farming spiked as the concentration of inhabitants from the shoreline moved inland. Therefore, the fish were transported to markets in neighboring towns. In the Hawaiian culture, a highly successful and skilled fisherman was an extremely valued and respected asset for the community . Hawaiians were the first islanders of the Pacific coast to benefit from the use of fishponds and the harvesting of fish . The sea was a great source of food for the Hawaiian people and especially for those living close to the fishponds. These ponds produced on average several hundred pounds of fish per acre annually . The main advantage of the fishpond was that it was not weather dependent, as it was blocked off from the possible rough conditions of the sea. Thus, you could acquire fish from the pond whenever needed . More importantly, ponds like Kaloko were places where Hawaiians could go to recreate their culture . The wealth and social status of a managing chief would be increased depending on how large their pond was and how many fish it was able to produce. The pond acted as a symbol of power for the managing chief, and with a bigger pond came more power. In order to build such a pond, the chief would already need to command the labor needed to transport the rocks and corals used in the construction.. Since the ponds required so much labor and resources, they were usually favored by people of royalty status who could afford them. Kaloko fishpond is a literal representation of the hard work of ancient Hawaiians, in their efforts to originally build the kuapa. It demonstrated traditional building methods like dry stacking that the ancient Hawaiians had perfected so well . Therefore, through the wishes of the Hawaiians, the kuapa at Kaloko fishpond should preferably be restored and managed by native or part Hawaiians familiar with the area . Mythology plays a large role in the lives of the Hawaiian people, as well as with the history of the Kaloko fishpond. Hawaii is home to many sacred places, secrets, myths, and legends. Each and every pond has its own unique stories–– specifically, the Kaloko fishpond is a sacred place where Hawaiians and visitors go to practice the tradition of leaving a small gift –– a lei, fruit, or nut  At many of these sacred places like Kaloko, historic events have occurred in the past like the birthing of a king . Moreover, some say that the bones of the first ruler of Hawaii–– the Great Kamehameha were secretly buried at a cave close by to the Kaloko fishpond . Kaloko fishpond is said to be the integration of natural, cultural, and supernatural. The supernatural people of Hawaii –– the Menehune, were said to be very small in size, similar to dwarves . Although there is no written history, they supposedly lived deep within the forest of the island, making repairs on the kuapa at night when no one could recognize them. With traditional construction methods, a large fishpond would take a long time to build, especially since the main tools used were ropes, digging sticks, and sleds . According to the legends, the Menehune people were displaced upon the arrival of the first settlers . Fishponds like Kaloko allow Hawaiians and visitors to connect with the spirit and magic of traditional Hawaiian culture. It is a place where you can escape from the everyday routine, to listen to the voice of the land and generations of people . The entire area of Kaloko fishpond is consumed with spiritual powers. More importantly, there is an immense amount of spiritual power that goes into the construction of the kuapa . As mentioned by the native Hawaiians working at the National Park Service, if one is able to build a connection and assign spiritual value to the pond, their understanding of the culture and area will be strengthened and they will feel more inclined to restore it . Although the National Park Service, a branch of the United States federal government purchased the Kaloko Fishpond in 1988, the fishpond also remains an important aspect of architectural history for the local communities. Due to the significance of the Kaloko fishpond, many local communities, with the support of government organizations and NGOs, have, and continue to initiate numerous large-scale and small-scale restoration projects. In Hawaii, fishpond restoration projects follow two important phrases; Ho‘omanawanui, “take your time and do not rush,” and kūlia i ka nu‘u, “strive for the highest, and do your very best” . The two phrases emphasize the local community’s idea that quality and hard work are more crucial and valuable than simply completed work. The restoration of the Kaloko fishpond aims to achieve various forms of restoration — the protection and preservation of this natural area but also the ability to encapsulate and accurately represent Hawaiian traditions and culture . With the successful collaborations of the National Park Service, various NGO’s and the local community, many initiatives were created to restore the environmental, historical and cultural value of the Kaloko fishpond. Prior to 1996, the walls of the Kaloko Fishpond were destroyed by local storms and hurricanes. However, in 1996, Carol Wyban conducted a study to examine the feasibility of restoring the fishpond, in which she concluded that its restoration “is a feasible goal for the long-term vision of the Kaloko-Honokohau National Historical Park”. With Wyban’s results, the process of restoration of the Kaloko Fishpond began . Before physical restoration efforts are allowed, one must first obtain the required permits for the process . After the permits were completed and approved, the National Park Service provided the program’s lead archaeologist with $55,000 for restoration efforts of the Kaloko fishpond . Phase I of the Kaloko Fishpond restoration plan commenced in October 1998 with a goal to restore the south makaha (sluice gate) and a part of the kuapa. Phase II began in May of 2000 after the completion of Phase I. During Phase II, the local community rebuilt the south end of the Kaloko Fishpond while the National Park Service worked to reduce the number of invasive species in or near the fishpond. The completion of Phase II resulted in a drastic change to the fishpond — greatly improving its wildlife diversity, water clarity and visitor experience. Phase III aimed to restore the northern makaha of the Kaloko Fishpond by the end of 2005. This change will have resulted in full water circulation within and outside of the pond . These three phases of Kaloko Fishpond restoration emphasized the rebuilding of the pond using traditional Native Hawaiian methods such as dry-stacking of the rocks. Because of the emphasis on dry-stacking, the restoration process was headed by Peter Keka, a master masoner with expert knowledge on such traditional forms of restoration. Like many Native Hawaiians, Peter learned his traditional masonry skills from his grandfather and father. Peter is currently working to share his expertise with other trained individuals in hopes to create a larger group of people who understand traditional practices of building . Differing parties - reaching both local and international levels - are currently involved with the restoration of the Kaloko fishpond. These parties include: governments, international and local non-government organizations, local fishermen and their communities. These diverse groups work together to help restore and reach the sustainable management goals of the fishpond to create large impacts on the lives of the aquaculture and the local people. Governments lead the restoration effort through various funding towards projects such as the restoration of the fishpond. Through law enforcement and regulations, citizens are held accountable as governments can penalize decisions and actions that may harm the Kaloko fishpond. In 1978, the 1160 acre land was established as Kaloko-Honokōhau National Historical Park and set aside “to provide a center for the preservation, interpretation, and perpetuation of traditional Native Hawaiian activities and culture, and to demonstrate historic land use patterns as well as to provide a needed resource for the education, enjoyment, and appreciation of such traditional Native Hawaiian activities and culture by local residents and visitors.” . The National Park Service maintains management of the fishpond by implementing policies, laws, and regulations adhering to the general formulation Nationals Parks go through when established. It further administers the fundamental law commonly known as the 1916 Organic Act which mandates the board  “to conserve the scenery and the natural and historic objects and the wild life therein and to provide for the enjoyment of the same in such manner and by such means as will leave them unimpaired for the enjoyment of future generations.”  Along with the establishment of the park, the government ensured that the laws and regulations must fall “in accordance with the guidelines provided in the study report entitled "Kaloko-Honokōhau" prepared by the Honokohau Study Advisory Commission and the National Park Service” . During the process of establishing the national park, problems were pinpointed by land surveyors and were taken account of during the proposed management actions. In the The National Parks Service general management plan, “proposed action, which is the National Park Service's general management plan, would lead to full development of the park. Needed facilities proposed in the park, however, will be built in areas which do not contain cultural or natural resources and located away from the coast. They will be of a design that blends in with the historical and open character of the park's landscape. Moreover, they are to be located so as to not interfere with in-depth traditional Hawaiian cultural pursuits taking place in the park.” . Without a proposed action, the lack of visitor orientation facilities, interpretive staff, and the absence of boundary fencing would increase the potential for disturbance or damage to cultural sites or features from uninformed visitors. "Vehicle access from the existing highway to the orientation center is to be developed. No other roads are proposed in the park. Utilities are to be run into the park from the highway. All utilities would be underground. A park-wide trail system is proposed to give visitors access to the park's cultural and natural attributes.” . “The construction of a visitor orientation center and a park interpretive division would greatly increase the visitor’s knowledge and appreciation of the park‘s cultural resources.” It is also important that “The live-in cultural education complex, under the minimum requirements alternative, is to be developed as it would have been by the ancient Hawaiians. Only traditional tools and methods would be used. No modern amenities would be provided at the facility.” . “The introduction of underground sewer lines into the park would create the potential for an adverse effect on the park's groundwater. However, the construction of rest rooms would significantly reduce the adverse effect now occurring from contamination of anchialine pools, fishponds, and near-shore waters by human waste.” . Once a month, the Hui Kaloko-Honokohau group organizes a community workday at the Kaloko fishpond . Here, local community members and the occasional tourists volunteer to remove invasive species and complete several other tasks to restore and maintain the natural beauty of the fishpond . After the work day is complete, the Hui Kaloko-Honokohau group concludes the evening with a Hawaiian potluck, storytale and music . Through this process, the volunteers are able to help create a healthy fishpond that welcomes a diverse group of wildlife while simultaneously immersing and learning more about the local Hawaiian culture. Every year in November, the Kaloko-Honokohau National Historical Park organizes the Children’s Culture Festival. 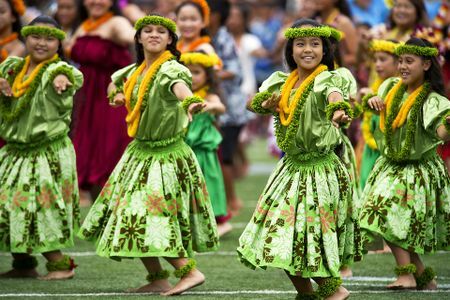 During this festival, children receive an opportunity to learn about Hawaiian traditions and culture through learning and performing traditional Hawaiian song and dance numbers . The Kaloko fishpond region further provides educational opportunities to high school students, running programs that teach them how to fish, how the fishponds work and much more . These investments in early education allow children and teenagers to take pride in their connection to the fishpond and the Hawaiian culture at a young age. Students and faculty at the University of Hawai’i at Manoa and Native representatives of various fishponds around Hawaii combined their respective knowledge of fishponds to create the Hui Mālama Loko group. The idea of this group is to share resources across disciplines to form a fishpond restoration plan that integrates “cultural and environmental resilience with contemporary technology” . Brian Glazer, an oceanography professor at the University of Hawai’i discussed the issue that although there has been rapid technological advancements in recent years, many of these advancements have not yet implemented into oceanography related research. Regardless of this obstacle, Glazer has collaborated with various government organizations and NGOs including the National Science Foundation, Kuaʻāina Ulu ʻAuamo (KUA) and the Paepae o He’eia to receive funding for such technologies. Glazer and his team have “developed low-cost wireless sensor packages that measure meteorological data, tides, water temperature” and more . These forms of technology can inform the public, government officials and researchers of the health status of the fishpond. Further, the Native Hawaiians can share their traditional methods of measuring fishpond health with universities, locals and visitors . Through the collaborative efforts of local communities, researchers, government organizations and NGOs, the Kaloko fishpond will receive the funding, expertise and supplies necessary for its successful restoration. If young students, university students or tourists seek to understand the cultural significance of the Kaloko fishpond, one must consult a Native Hawaiian with extensive knowledge on the topic. Due to the importance of Native knowledge in the restoration process of the Kaloko fishpond, the previous Advising Commissioner of the Kaloko Honokohau National Historical Park suggested a few amendments to its restoration . First, he suggested that the Kaloko fishpond region recruit a fully Native Hawaiian Advisory Council that will be consulted for further developments in the area. Further, he requested that future developments in the region were to be managed, directed and agreed upon by a qualified Native Hawaiian. Most ambitious of all, the previous Advising Commissioner recommended the construction of a cultural live-in centre. This cultural live-in centre will emulate Hawaiian fishing, cooking and cleaning methods of Hawaiian communities from hundreds of years ago. Present day Native Hawaiians will be given the opportunity to live in these cultural centres to learn more about Hawaiian cultures and traditions from several years ago . After years of neglect, the fishpond was physically destroyed, and therefore the Hawaiian people could no longer practice their traditional ways, resulting in its loss of value. Through the collaborative management by governments, international and local NGOs and local communities, many initiatives were established to restore the environmental, historical and cultural value of the Kaloko Fishpond. The Kaloko Fishpond is a hub of marine life diversity, enriched with culture and magnificent architecture that should remain protected for generations to follow. ↑ 3.03.13.23.33.4 Bond, S. (2003). Restoring a part of Hawai’i’s past: Kaloko fishpond restoration. Ecological restoration (284-289). University of Wisconsin Press.